MY Solid Rock . 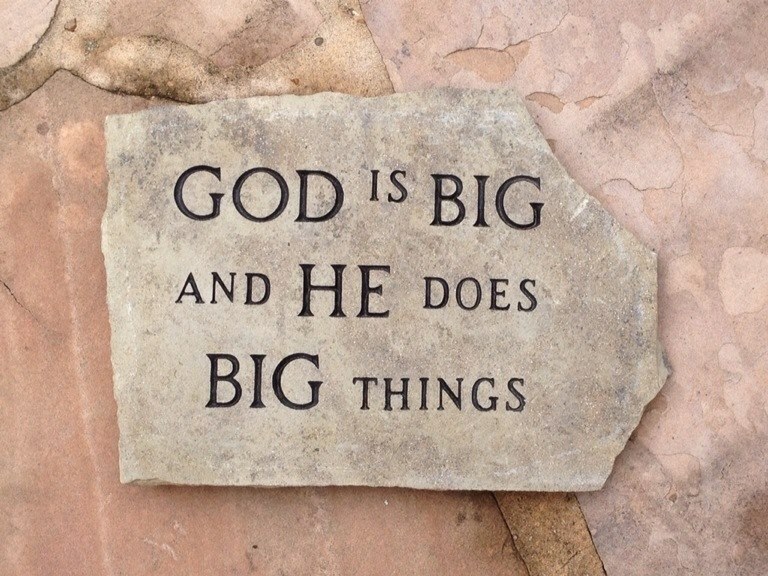 . .
My dear friend Brian Long, who is the worship pastor at the 11:11 am service at Second Baptist Church, several months ago brought me a stone with the words “God Is Big And He Does Big Things” engraved (etched) on it. Brian’s brother, Jay, printed the words on a heavy stone piece. It now rests by the front door for all to see. Brian didn’t know, at that time, that I had decided to write a blog of the same name. He brought it because during our time of ministry together Brian and Cliff Young wrote a song called “God Is Big And He Does Big Things” for children’s worship. It is a great gift that reminds me each day that my faith and hope is built on The solid rock. It’s time to sing again Facebook Family Singers . . .
All other ground is sinking sound. That stone Brian brought is heavy, but not as heavy as the Rock on which my faith is built. Without this faith, my journey would definitely be different. I cannot say that I don’t have daily fears and anxiety, but “when I am afraid, I will trust in Thee.” My hope for you today is that you know where your life is anchored, and where you have planted your feet.